Garment Designer Plug-Ins are additional features to the Garment Designer pattern making software. Get 50+ additional styles with each Style Set. Create unique Totes bag with Cochenille’s Couture Totes Collection. Prepare for the Holidays with our Holiday collection. Style Sets are optional plug-ins to Garment Designer which add more style options to mix and match with existing styles. There are generally 50 new style features per Style Set, based on current fashions and User requests. This set provides you with 45+ additional style elements (basic tops, boleros, vests, necklines, armholes, etc) that will work and match with the original Garment Designer and other Style Set files. This Style Set contains 50+ additional style elements (body styles, neckline, skirt, pants, scalloped hems, etc) that will work and match with the original Garment Designer and other Style Set files. Couture Totes “Cool Totes” features collections 1 and 2. Each collection contains 6 totes/bags based on themes. The first two collections released in late February 2003. Other collections are in development. 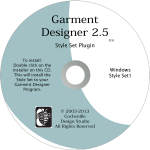 Designed for existing Garment Designer owners (version 2.0 and newer). You will be able to to edit styles, save files, etc. Once installed, open your Garment Designer program and select “Collection” through the Category menu option and “Couture Totes” through the Collection menu option. You can then select the appropriate style and size. A PDF manual is included with each collection. This contains the ‘how-to’s on using the program, and sewing instructions plus knitting and crochet how-to’s. Holiday Collection 1 features a collection of holiday patterns for stockings, gift items and accessories. There are 18 styles in total. Designed for existing Garment Designer owners (version 2.0 and newer). You will be able to to edit styles, save files, etc. Once installed, open your Garment Designer program and select “Collection” through the Category menu option and “Holiday” through the Collection menu option. You can then select the appropriate style and size.